More people than ever before in history are shopping online because it gives freedom to shop at your own pace and convenience but we love buying at good old brick and mortar shopping stores. How about a shopping experience at stores without checkout lane and long queue. Soon, Amazon is giving beyond the regular shopping experience with the Amazon Go. 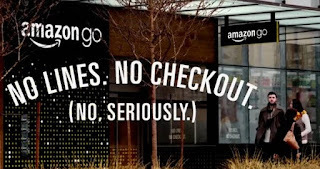 Amazon Go, a new grocery venture where people will come in to shop, pick the items and walk straight out again with the items they need. In nutshell There's no need to wait in line for billing and checkout. Shoppers can simply take items in their bag and afterwards leave. The technology depends upon the cameras visions and sensors backed by AI algorithms . A dedicated app is used to gain access to an Amazon Go store, apparently via barcode-scanning. After that, any items picked up by its users is automatically added to their virtual card, with the technology automatically updating things if any items are put back on the shelves later on. When you're done, you just walk out. The app simply charges the cost of your items to your Amazon card with a receipt sent directly to the app. Amazon Go is going to open in early 2017 with 1,800-square foot area in Amazon's home city.